Coast to Coast: Could Mariota End Up in Buffalo? Over the next four weeks, FishDuck.com Feature Writer Caleb Couturie will be analyzing the 25 teams in the NFL Draft that may look to select Marcus Mariota. BUF’s Draft Pick: None in the first round. Buffalo is very Cleveland-esque. The Bills have an excellent defense and they are starting to build an offense with weapons, but they lack one very important piece: a quality QB. The Bills spent the past two drafts really revamping their offense, including adding stellar WRs Sammy Watkins and Robert Woods. 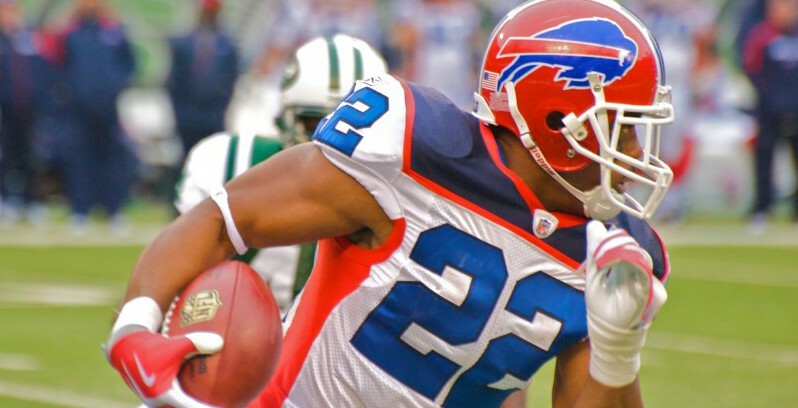 The Bills also have a solid veteran RB in Fred Jackson. Of course, the infamous Bills draft pick was taking E.J. Manuel with the 16th pick of the 2013 draft. Manuel turned out to be a dud and the other key piece of their offense, spark-plug RB C.J. Spiller, is yet to prove he can stay healthy. The Bills also worked on their offensive line, though, spending a lot of early round picks on linemen in recent years. With a healthy Spiller the Bills should, in theory, be able to put it all together with Marcus Mariota. Buffalo trades Woods, 2015 second-round pick, 2016 first and second-round pick, and 2017 first-round pick to Tampa Bay for the No. 1 pick. This is an exceptionally hard trade for Buffalo to pull off, mainly because of the lack of pieces the Bills have to offer. They gave up this year’s first-rounder to Cleveland last year, and they don’t really have a QB they can trade to Tampa Bay to make the Bucs happy. Hopefully, four extra draft picks and a solid slot WR would be enough for TB to take the offer. Woods is a really promising player, and he would fit in nicely lined up in the slot with Mike Evans and Vincent Jackson. As for Buffalo, they are in a solid position to finally make a move in the AFC East. The Patriots and Tom Brady have a clock ticking that’s about to run out of time, and although Miami is good they won’t be going anywhere with Ryan Tannehill as their QB. If there were ever a time for the Bills to make a big move, it’s now. The question isn’t if the Bills should do it, but instead it’s do they have the trade pieces to pull it off? It’s really, really cold in Buffalo. Weather that harsh would certainly be a factor in Mariota’s transition to the pros. Playing in serious snow for the first time would affect anyone, but certainly the Hawaiian would have a hard time adapting to the negative temperatures. Other than that, though, Buffalo is still a young team, and a solid one at that. I mentioned the offensive pieces earlier, led by Watkins and Jackson, and the group as a whole is certainly headed in the right direction. The line is solid, so he should be plenty protected, and finally the defense would be able to keep the Bills in a lot of games. Playing in the AFC East would certainly help Mariota grow, especially playing across the field from legends like Tom Brady. The only real worry in Buffalo is the weather. Hopefully not. The Bills should, and most likely would, start a veteran (someone such as the now retired Kyle Orton) while Mariota adjusted to the system. If it came to it, I’d even expect the Bills to throw Manuel in over Mariota. While Mariota would certainly be the best QB on the roster, the more time he would have to adjust and learn the Bills’ offense the better. He would most likely take over around Week 11 though, since Mariota is a quick learner and Buffalo would definitely be eager to put him in and see what he could do.